I was having a conversation last week with a local producer who was trying to put together a piece commemorating the 25th anniversary of the South Central Los Angeles Riots. Before I could even get into the conversation--which was probably my fifth at the time on the exact same subject I’d had with other producers--I had to break down for her the difference between labeling what happened in 1992 as a riot versus a rebellion, uprising or civil unrest and the reaction that “riot” evokes in the people she’s trying to get to participate. In my experience, those looking from the outside in often use the term riot while those who were there understand that it wasn’t just Black people wilin’ it out for the sake of wilin’ out. Over the next few days there is no angle that is not going to be exploited and exhausted in discussing and dissecting what happened in Los Angeles 25 years ago--except for one. The role that the Black media played in communicating to and connecting the stories of the Blacks in South Los Angeles to Blacks everywhere. In 1992 our version of social media happened weekly on Thursdays and Fridays when most Black newspapers published. When the 1992 Civil Unrest occurred, the mainstream media was scrambling trying to find and hire Black reporters and photographers who could get into Black neighborhoods and get stories without being booted out by angry residents who were tired of being exploited and mischaracterized on the evening news and in the Los Angeles Times. Television newscasts opened with words like “riot” and with images of Black people running through the streets of South Los Angeles, Watts and Compton with couches, television, shoes and groceries. There are even some reporters and photographers today that have written reflection pieces as if they survived World War 3 commemorating the 25th anniversary of those six days in the spring of 1992. But what about the drumbeat of the Black community? Los Angeles’ Black media has not had their story told. How newspapers like the Los Angeles Sentinel, L.A. Watts Times and Final Call, continue to provide Blacks in Los Angeles with culturally relevant news from a Black perspective. How when in 1992 Black people were being labeled as thieves, looters, rioters, and arsonists and seemingly being compared to animals running wild and in need of control --it was the Black media who set the story straight and explained that a community of people who have suffered police brutality and abject poverty didn’t necessarily view the structures burned down as their own and that while there was some unnecessary looting, the majority of the looting was for food and necessities. And then there’s the story of how 25 years later, an early morning show called the Front Page on a little Black owned radio station called KJLH is still on the air discussing issues from a Black perspective. It was KJLH who helped a woman who had called into the station crying about needing her insulin and being unable to get it because her local drugstore had been burnt down. Within hours the station had connected her with a doctor who was able to help her. It was KJLH who broadcasted around the clock from their 3847 Crenshaw location when reporters from other stations like KFWB were not allowed into the area or were chased out of the community by Blacks. I spoke with former KJLH News Director Carl Nelson who explained to me that after the death of teenager Latasha Harlins it was KJLH who opened their phone lines to the community who by then were beyond frustrated with their relationship with the Korean American community. A year later when the acquittals were announced for the four Los Angeles police officers involved in videotaped arrest and beating of Rodney King, it was KJLH who everyone had to tune into listen to because the brothas in the community wouldn’t let anyone who didn’t live over there past a perimeter set up on Crenshaw and Adams--including reporters and photographers. What started off in 1991 as 15 minutes at six in the morning for the community to sound off on issues important to them morphed into 90 minutes of L.A. radio’s longest running daily news talk show for, about and by Black people. A show that can still be heard from 4:30 a.m. to 6 a.m. on KJLH Monday through Friday. So while the mainstream media is falling over themselves trying to retell the events of 1992, I think it’s important to remember the role that the Black media played in telling and sharing our stories. What happened in 1992 was not just a bunch of angry poor Black people trying to come up on free stuff and burning buildings down. It was six days in the spring in 1992 before the advent of social media and the Black Lives Matters movement when Black people in Los Angeles collectively said and showed that their lives mattered. 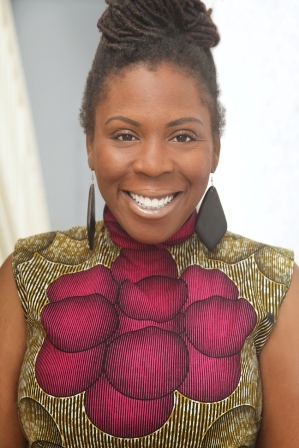 Jasmyne A. Cannick is nationally known television and radio commentator on social, political, and race issues who works in politics as a communications strategist. Follow her on Twitter @Jasmyne and on Facebook @JasmyneCannick. Her website is www.jasmyneonline.com.